100% cotton zebra print- outside layer. Zebra print color- (white & black.-100% cotton outside layer).Inner layer is PUL-polyurethane laminate. 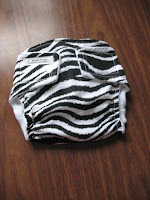 It's easy to use Velcro closures and helps keep diaper secure. Burp/Prefolded 3 Ply Cloth Diaper. Measuring 20in.x 14in. ( 50,8cm x 35,6cm). It's birdeye brand gerber. 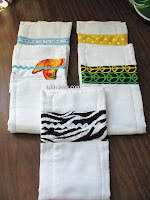 Our burp cloths are made from 100% cotton cloth diapers. Blue grosgrain w/ spring prints. (2 burp available-limited). Zebra print. ( fabric w/ white rick rack in the center). Butterfly prints. ( fabric w/ blue rick rack in the center).